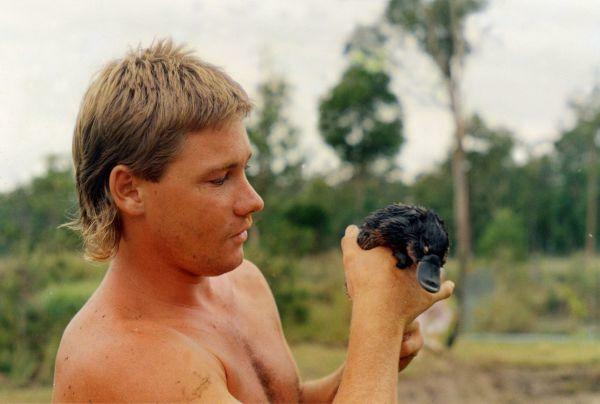 Steve showing some skin and holding a small Platypus. Steve, if i ever got to meet you or Terrie, I'd be in Heaven. i watch your show every morning. u are my hero. It is so good to see Steve again. I have missed him so much. Steve was and still is my insperation and I am hopefully going to continue his line of work. Yes Steve is hot and if he were alive and I had met him I would possibly be Drowning him in questions. But erm... I hope that Terri, Bindi and Robert and Steve's dad are doing okay. There is plenty of reason to be upset about Poor Steve's death but it was a kind of Fluke. Usually Stingrays use the barb when being stood on or something like that but this was a rare thing, they never really do it. Also, Only one other person has been killed by a stingray and that was in the 1940s. Yes I am going to addmit (exuse my rubbish spelling) I am still extreamly upset after the past events but I am not going to let that hold me back. We need to remember Steve as he was before he died, And I hate stingrays but that doesn't mean I want to hunt 'em because that is not what Steve would have wanted. I mean I still go to the Aqueriam and I still pet the Rays but doesn't change the way I feel about the one Ray that killed my Hero! Erm... And I believe that even though he didn't met all his fans, I believe he is watching over us. I miss you Steve-o every minute of every day and I am DEFINATLY going to continue you work. And I acctully want to catch a CROC have a photo and yell to the heavens "YES I DID IT STEVE, I CAUGHT A CROC WAHOO..." So yeah. Crikey ! Mate I miss you so so so so so much! Love you Steve, Miss you so much, M.Y.S.R.I.P (may your soul rest in peace). Good to see his face again, He shouldn't be forgotten,he did very good work. Aww~! The platypus is cute! THIS IS A SO GORGEOUS PIC!!! He was my hero! I admired a lot his adventurous spirit, the energy and joy that were reflected in his show, his capacity to improvise, the great enthusiasm and dedication that he showed and transmitted to million people, and the way in which he really enjoyed the contact with nature, although in those conditions it\'s not posible to sleep neither to eat well. I was amazed by way in which Steve could spend long time in forests and jungles and places like these for the running of his show, he had a great love to animals, and everytime I watched his show I was so thrilled that I wanted to be there to help him with the camera or to put to the snakes in bags when he needed to transport them of a urban place to take them to their natural habitat, or something like that, and to be a while with him. Sharing his passion for nature! I admired so much his patience to get close to animals and wait until they left their hiding places to film them, and I loved to see how he approache to the animals; when he approached to the animals he said: \"come on buddy!\" he treated them as a part of us! not like unknown and dangerous beasts as many people used to think. Also I loved to see when he apologized with animals, when an animal bitted or stung him he apologized with them because he said it was his fault, by get too close and don\'t give space to them, he even said us that we don\'t have to approach too close to the animals because they can feel we want to damage them, it was a very noble and kind detail and something funny, although many people (including my father) thought for that reason he was crazy, but he knew what he did, he showed that the animals need their space and he made sure that people did not approach too much. Steve was my insparation, I was such a huge fan of his show The Crocodile Hunter. Him and his wife Terri were so cool and they had a great sense of adventure, and were particularly smart when it came to animals, and I\'m now doing an English paper on his life story, and i hope one day it will be published on this very website. Terri, I wish you well and rest in peace Steve. steve you were the best rest in peace.